Follow Eric Olafson’s epic adventure through a multicultural mega civilization as he goes deep undercover in the 51st century as Black Velvet – a female pirate captain of a mysterious background. Thrust into the life of a starship captain, Eric Olafson is now the commanding officer of the famous spacecraft, the USS Tigershark. On their mission to hunt pirates and criminals, Eric and his unusual crew are sent into Freespace, disguised as the very outlaws they are chasing. 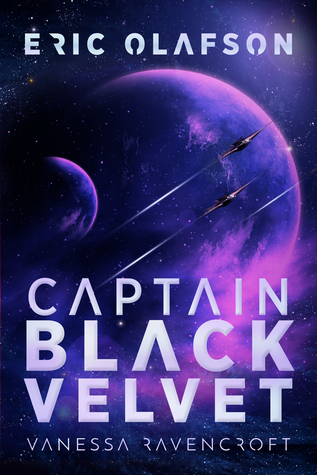 Eric reveals himself as Black Velvet, a gorgeous female with long blonde hair, a killer body, and a reputation that stirs fear throughout the galaxies in civilians, space pirates and criminals alike. Eric is still oblivious to the fact that he is destined to play a central role in an ancient conflict of cosmic proportions, but something is stirring. I wish that I had read the earlier books written about Eric Olafson and his adventures around space. I only got a glimpse into past books and the relationships that are in Eric Olafson: Captain Black Velvet. I am that type of reader that needs to know everything going on in the book. If that means reading every book up until the one I am reviewing, I will do it. So, I do feel that I missed out a bit when reading Eric Olafson: Captain Black Velvet. I enjoyed reading Eric Olafson: Captain Black Velvet. This had to be the most epic space opera that I have ever read and it is a long book, 542 pages. But you forget how long the book is once you start reading. The author did such a great job with world and character building. I could picture them standing right next to me. I enjoyed that the author took the time to round out even the most trivial character. It made the book for me. Erica I liked…..a lot She was the most feminine thing that I have read to date. But she also retained some of her male attitude and outlook. Oh yeah, did I forget to mention that she is male to female transgender? Yup. Erica, having been accepted as a transgender woman by her crew, also made the book for me. It also helped that she was pretty badass. I mean, she took on other alien lifeforms in the Death Fight Arena and in the process, saved a Nul Prince. While she ran a tight crew, Erica also had a soft spot for being in trouble. That is how she ended up with two Togar, tiger-like beings with a taste for human flesh, and other beings. They became part of her crew. That made for a very eclectic and unusual crew that people talked about. The fact that she was deep undercover as a pirate added more oomph to the book. Erica also got into her fair share of trouble and had men chasing her all over the universe!! The shenanigans that she got into and out of was fantastic and, of course, it was done as bloody as possible. Again, something that I enjoyed. The end of the book was very action filled. I liked that none of the plot lines were wrapped up. That left it open for the next books, which I cannot wait to read. While I am waiting, I am going to pick up the other Eric Olafson books. Eric Olafson: Captain Black Velvet was an absolute dream to read. Staying true to the space opera/science fiction genre, I was taken on a wild ride around the universe. I was also introduced to memorable characters. The book is a bit long but that did nothing to take away from the wonderful character and world building in the book. This is definitely a book that I would read again. I also plan on reading the earlier books so I can get a better grip on the characters. Why: Violence and some sexual situations (nothing graphic but implied).